Kadwaha! 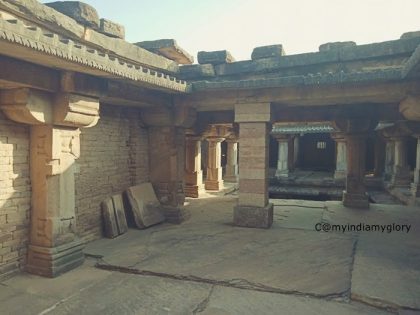 This village located in Isagarh tehsil in Ashoknagar district of Madhya Pradesh may sound like any other village of India. But it is not so! It carries the legacy of the glory of ancient India, especially from 8th-11th centuries, from this region. An ancient Mutt Gurukul and few existing temples here speak volume about the contemporary life of those times. 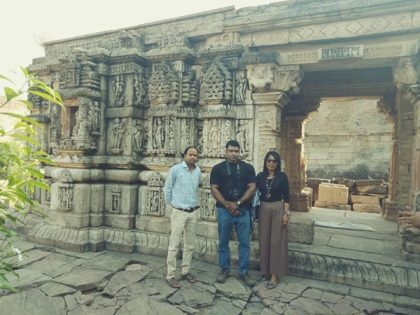 Visiting these heritage sites, one question is bound to crop up in the minds of the visitors – How were ancient Indians so talented? The talent of artists exhibited in the sculptures of the temples in Kadwaha and ancient temples across India is matchless. Seeing these temples, we remain awe-inspired. Will our future generations, say after a thousand years, be awe-inspired viewing 18th to 21st century temples? No! Today’s temples do not exhibit such finesse, grandeur, expertise, and exquisiteness. In short, ancient Indians, i.e. our ancestors were far advanced in every field compared to the present. Islamic invasion and rule followed by British supremacy have destroyed our talent base over time. Islamic invaders destroyed thousands of our grand temples, razing them to the ground. Those structures that have survived destruction speak a lot about our past glory and splendor. A 9th century Mutt, which also served as Gurukul (educational institution), in Kadwaha may look like a small fort in ruins when viewed from a little distance. Mutts and temples served as educational institutions in ancient India. This Mutt is also known as Garhi Temple and Monastery. Few scholars mention it as Chandla Mutt. The grandeur is revealed when one explores its interiors. The massive Mutt is a three-storey complex built of huge and small blocks of dressed sandstone with large slabs being used as roofs. It has a central open square courtyard. Natural light is facilitated through this open space to the pillared corridors on all sides including the meditation cells, study areas, halls, and chambers. There is a small entrance on the north. There are several rooms in all the three floors. While the ground floor was dedicated to the students’ study, lodging, cooking and treasury vault, the 1st floor was dedicated to the Acharyas, Gurus, and other sages. The 2nd floor, i.e, top floor was reserved for pilgrims and visitors. 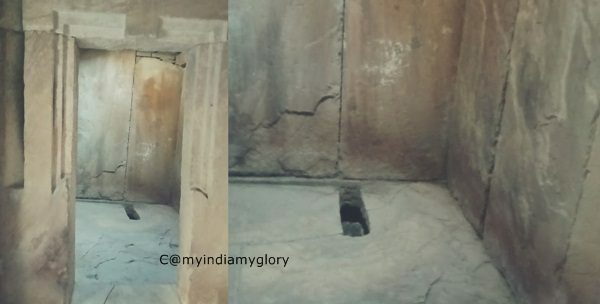 Toilet systems in separate washrooms, one at the 1st floor and one at the ground floor just below it, describe volume about the advanced techniques exploited during ancient times. According to this inscription, Avantivarman was the ruler of Kadwaha and surrounding regions in Bundelkhand. There are several kings by this name from different dynasties in Kashmir, Kamrupa, Malwa of different time periods. But the inscription does not mention which dynasty he belonged. Few scholars claim him to be from the later Gurjar Pratihars while few deem him as a Chalukya. Raja Avantivarman visited the ashrama of Purandara, a Shaiva Sage. The king exhibited profound respect for the Sage and persuaded him to settle in his kingdom. Once settled, the king requested Purandara to initiate him into the Shaiva sect through diksha. Purandara performed the rites and rituals and became the king’s Guru. Subsequently, Raja Avantivarman became successful in all his endeavors. In return, the king gifted royal resources to his Guru. Purandara, in turn, utilized those resources to establish two Mutts (monasteries/learning centres), one near Rannod as a retreat for Sages and one at Kadwaha as a learning centre. The inscription mentions Mattamayura (later named Kadwaha) as the capital city of Raja Avantivarman. It was at the veranda of the Mutt near Rannod that this info was inscribed. Kadwaha was also called Kadambaguha. According to another inscription at the Mutt at Kadwaha, when Sadasiva was the head Guru of the Mutt, a Gurjar Pratihar king named Harihara visited the site. After the death of Purandara, his key disciple Dharmativa took charge of the Mutt. Sadasiva was the second disciple in succession. Harihara wanted the Saiva Sage to be his Guru. However, Sadasiva did not agree immediately. He first took a test of the king. He asked the king diplomatic questions to which the latter replied right in reverence. One of the questions Sadasiva asked was – “Who is this king, who seems so full of life?” Besides, one of the royal officers eulogized Harihara and the greatness of the Gurjar Pratihara lineage. Sadasiva then agreed to initiate Harihara into the Shaiva sect and gave him diksha. In return, Raja Harihara gifted Sadasiva few royal elephants. Sadasiva was not satisfied with the gift. During ancient times, Gurukuls and village temples that acted as learning centres earned the patronage of kings and wealthy people, especially as donations. These donations were used to run the Gurukuls, support the Acharyas/teachers, visiting Sages, and for other activities. How could elephants meet the needs! Harihara made other repeat offers, but again to the dissatisfaction of Sadasiva. The Saiva Sage ultimately asked for a few agricultural villages. The annual revenue collected from these villages would well meet their needs. Raja Harihara granted his request. The Kadwaha inscription also describes an incident related to a neighboring king named Gobhata and Sage Dharmativa, another successor of Purandara. Raja Gobhata visited the Mutt and created a sort of a chaos that resulted in the death of an Acharya (monk). This angered Dharmativa. He invoked Mahadev and carried out a magical vendetta against Gobhata. Though he defeated the meddling king, Dharmativa could not survive. Kadwaha Mutt was renowned far and wide. Students from far off places came to study in this Gurukul. Sages from far and wide visited the Mutt. According to another inscription, Prabhasiva, one of Purandara’s successors became very famous. He was deemed a ‘crown jewel’ amongst Saivas. Raja Yuvarajadeva of Kalacuri, a kingdom located 200 miles away from Kadwaha, declared Prabhasiva as the ‘Master of all Sages’. During those times, kings visited Mutts of other kingdoms and persuaded the head Acharya or other Acharyas to establish Mutts/Gurukuls in their respective kingdoms. The Sages received no interference from the rulers. Raja Yuvarajadeva visited Kadwaha Mutt and persuaded Prabhasiva to be his Guru and shift base to Kalacuri. Yuvarajadeva’s wife Nohalu was the granddaughter of Raja Avantivarman, whose Guru was Purandara, the founder of the Kadwaha Mutt. Numerous inscriptions find mention of Nohalu as a patroness of Shaiva temples and institutions. Prabhasiva left Kadwaha Mutt in the hands of one of his disciples and shifted base to Kalacuri along with few students. Raja Yuvarajadeva set up a grand Mutt in his kingdom to accommodate Prabhasiva and his students. 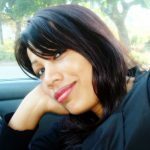 Prabhasiva did not settle at one place. He travelled widely and established a number of Mutts (Gurukuls) and temples wherever he went. Prabhasiva’s followers followed his footsteps. Likewise, they established Mutts and temples across Gujarat, Rajasthan, Maharashtra, Orissa, Andhra Pradesh, Tamilnadu, and more parts of India. There is a temple of Mahadev at the Kadwaha Mutt premise. The Mutt is located towards the south of the temple. This temple, facing west, is also known as Gadhi temple and Garhi temple. The design of the temple conforms to three planes of offsets in plan and elevation, called tri-anga. It preserves the columnar hall (mandapa). A Shivalinga planted in a high yoni-pitha adorns the garbhagriha (sanctum sanctorum). The doorframe is decorated with five jambs and the flat ceiling is carved with lotus in relief. The central part of door lintel depicts Natraja and Uma-Maheshvara and Lakshmi-Narayana at the terminal projections. Recesses depict navagrahas while the architrave depicts the twelve forms of Adityas (Surya Dev). The wall-offsets flanking central projection of the walls and the recess between wall-bays depict deities, nayikas, and rampant-lion motifs called vyalas. The rampant-lion motifs are common in hundreds of temples across India. The corner wall-divisions depict guardians of the directions called dikpalas. The wall portion in front of the sanctum door on both the sides depicts deities. A dancing Ganesha and Kshemankari Goddess adorn the central projection of the wall in south, Chamunda and Parvati in north. Deities in the east portion are missing. These must have been either stolen or destroyed. The wall frieze between the basal wall mouldings (vedibandha) and shikhara depicts deities including dancing Matrikas. The heavy pillars and pilasters of the columnar hall are ornamented with varied motifs. The present temple structure has survived destruction by Islamic invaders. 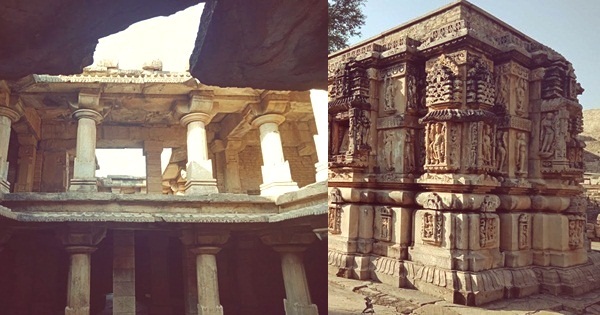 There are 15 temples dating back from 8th to 11th centuries at Kadwaha. Seven of these temples are dedicated to Vishnu and eight to Mahadev. With Islamic invasion and rule, thousands of Mutts and temples were destroyed or razed to the ground. 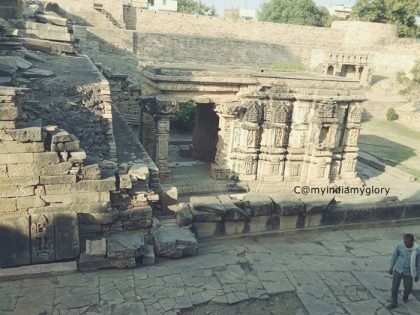 Alauddin Khilji not only ransacked the Kadwaha Mutt but also the temple of Mahadev. He could not raze the temple to the ground. To keep it away from public view, he got the temple covered with lime. He built a masjid in the temple and Mutt premise. This masjid still occupies the space of the Mutt. This happened in the beginning of the 14th century. Khilji and his men butchered innocent Hindus to death, sparing those who converted to Islam during their attacks. There is all probability that the barbaric plunderer might have killed the Acharyas, sages, and students. Bakhtiyar Khilji during his destruction of Nalanda University in 1193 did not spare the monks, Acharyas, and students. He killed thousands of them besides setting fire to the four multi-storey libraries that accommodated several million manuscripts. Likewise, Khilji must have destroyed the manuscripts and looted the treasury of the Mutt and temple. The Mutt has a treasury vault at the ground floor. This vault is located at a corner room. The door near the vault that is a passage for all has been designed in such a manner that when one enters, the shadow alerts the guard. The store room of the Mutt now has scores of broken statues of the temple and Mutt. 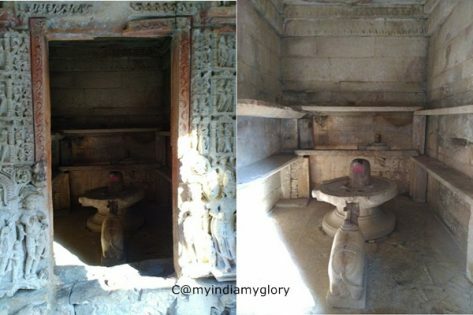 Adjacent to the store room is the kitchen with facilities for churning milk to for preparing ghee (holes created in the wall pillar), arrangement for water to flow out, etc. An inscription at Kadwaha mentions about the plunder and destruction of the site by Alauddin Khilji. The top floor of the Mutt has a diary for visitors and pilgrims. Diaries during those days were not like those of today. It was a big stone slab overlooking a window that served as the Visitors’ record/diary at this Mutt. Visitors engraved their names with year/date in the stone slab. The slab even has an engraving of Alauddin Khilji’s name, which meant the plunderer entered his name in the visitor’s records. The last visitor’s record was dated 1440 AD. This proves the Mutt restarted its operations few years after Khilji’s attack, but could not continue after the 15th century. This might be due to further attacks by Islamic invaders. During British rule, the British stopped grants and patronages that temples and Gurukuls enjoyed. As a result, the traditional education system collapsed. Kadwaha is a living example of a developed ancient India. This lost glory can be restored across the country through collective interest and effort. Let us pledge to bring back our lost education system. 5. Kadwaha Temples, in Art Icon and Architecture in South Asia, Arvind Kumar Singh.